Eugene O’Neill, one of the finest dramatists of the 20th century, unfortunately seems to be underappreciated now in the 21st one. Apart from his greatest work, Long Days Journey into Night, few of his plays are regularly produced. This is unfortunate, because his last play, A Moon for the Misbegotten, is a show full of top talent, monumental drama, and most surprisingly, truly timeless comedy. Set on a rock-strewn farm in rural Connecticut during the early 1930’s, the story opens with Josie Hogan (Elise Hudson) a lanky, tough-talking farm woman helping her younger brother Mike Hogan (Michael Hinton) escape from the control of their “tyrannical” father. Phil Hogan (Conan McCarty), the father, is a scrappy Irish immigrant who knows the land and his whisky (both bonded and moonshine). The Hogan’s precarious existence as tenant farmers is further complicated by conflict with their wealthy neighbor T. Stedman Harder (Thomas Daniels) whose ice pond is perpetually invaded by the Hogan’s hogs. The play’s major catalyst comes with the arrival of James Tyrone Jr. (Anthony Marble), their landlord who threatens to sell the home to Harder. Plot complications multiply bringing the play to a not quite happy, yet perhaps melancholic close. Although the Hogans face opposition from the outside world, it is the conflict between Josie and her father Phil that stirs our emotions and most rewardingly tickles our funny bones. Elise Hudson is marvelous as Josie. She calls herself “an ugly, overgrown woman,” The audience sees a strong-willed, independent woman who could oppose any male, including her father. Conan McCarty’s Phil Hogan is a wily and blustery. The love-hate relationship between these two is evident as they endearingly refer to each other with derogatory descriptions. The two both evoke the strong, spirited existence of people who till the land on a back-breaking daily existence. The evening’s dramatic highlight is provided by Anthony Marble’s James Tyrone Jr. Marble’s theatrical, ne’er do well man of the world who breaks down in the play’s climactic third act, is truly touching. Clutching to Hudson’s tender yet grounded Earth-Mother, Marble literally lays to rest after an evening of binge-drinking. Apart from the splendid cast, under Joseph Discher’s direction, the show’s other feats demand attention. Emily Nichols’ simple, yet timely farmhouse set evokes its time and place. Collette Benoit’s costumes further reflect the sepia-toned 1930’s. 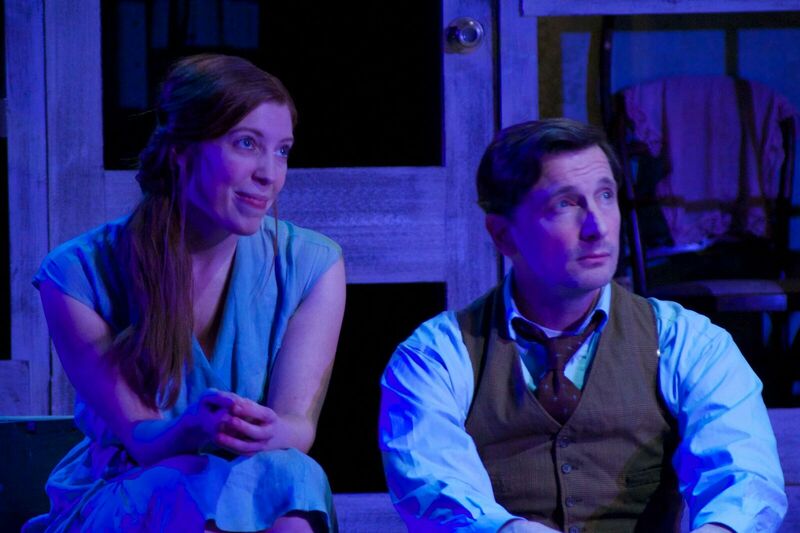 Both Joel Abbot’s sound design filled with Irish fiddle music and lighting designer Christopher Bell’s soft, romantic blue moonlight and blazingly hot sunshine further enhances the play’s contrasting long night’s journey into day. At three hours, this play is well worth time spent at Playhouse due to its beautiful performances and the richly poetic language that is Eugene O’Neill’s legacy to the American Theatre.